Windows Mobile device (aka Pocket PC Phone or PDA) doesn’t always work as intended, and like Windows PC, may crashes or not responding. In severe case, a hard reset would probably required to fresh clean boot the PPC Phone again. Eten Glofiish M800 is no exception. To perform a clean boot hard reset on Eten Glofiish M800, just follow below instructions. But note that hard reset will wipe off and erase all applications, settings and persona data from the PPC Phone device, so make sure backup all important data. Simultaneously press both power and reset buttons once. The Eten Glofiish M800 will restart. Wait until the orange Glofiish screen shows up. Press the Record button until Erase all data and load default? message shows up on the screen. Note: For earlier E-TEN and Glofiish brand models the key to press may be the red End Call button instead. Check the user manual for details. 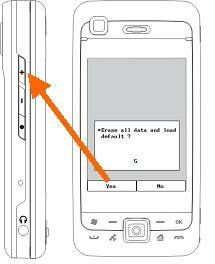 The default is “No.” If nothing is selected after a few seconds the system will automatically execute the default No. To hard reset, press the Volume Up button for a few seconds to select “Yes”. The system will erase all data and reset the device to the factory default settings. Note: To cancel simply do nothing while the timer counts down, the Windows Mobile device will then continue to boot as normal. After the Pocket PC restarts, follow the instructions on the screen to complete the set up.